The International Union League for Brand Responsibility expresses our staunchest support to the dock workers and the Union of Hong Kong Dockers (UHKD), the affiliate of the Hong Kong Confederation of Trade Unions (HKCTU), who are on strike in the container berths owned by Hong Kong International Terminals (HIT), the subsidiary of Hutchison Port Holdings Trust (HPHT) and Hutchison Whampoa Limited (HWL). We could not imagine that dockworkers employed at the berths you own and operate work in such hazardous conditions. It is unacceptable that these workers face health and safety risks daily, work extremely long shifts, and are not given meals and toilet breaks nor fair pay equivalent to their work. We find it surprising that dockworkers in Hong Kong, one of the top container ports in the world, are employed in conditions so shamefully below international labor standards. 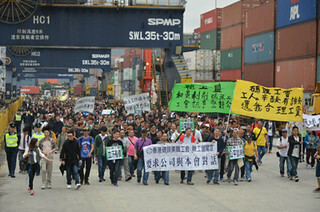 HIT, belonging to Hutchison Whampoa, has sought a temporary injunction, to be heard in the court for the granting of an official one on 5 April, to ban the striking workers and members of the union to enter HIT’s berths; and finally that this injunction is sought without negotiating for a settlement with UHKD that represents the majority of the workers. These are not practices the international community would expect from a responsible employer that owns and operates 320 berths in 26 countries. The Hong Kong SAR government has ratified Convention No.87 on Freedom of Association and Convention No.98 on Right to Organize and Collective Bargaining of the International Labor Organization (ILO). These conventions protect the right of workers to organize and negotiate with the employers over their working conditions free from retaliation. Observance to the international laws and the core labor standards is fundamental to protecting the wellbeing of the people in Hong Kong and the status of the territory in the international business and civil community. Your respect, and the respect of Hutchison Whampoa and HIT for these fundamental labor standards is not only a matter of importance to the dock workers and the trade unions in Hong Kong, but also of great concern to the international trade unions all over the world that represent workers where you and your companies operate. The international trade unions and the members are watching the development and expect to see a fair settlement over the strike under due procedure of ILO standards. We hereby urge HIT, Hutchison Port Holdings Trust and Hutchison Whampoa Limited to respect the fundamental right of the dock workers to strike, and demand fair remuneration and decent working conditions. We also ask HIT to respect UHKD in representing their members for collective bargaining with the management. We wish to see that HIT will negotiate in good faith with the striking workers and UHKD. Collective agreement should be signed between the union and HIT. No worker and member of the trade union will be punished for their participation in the strike. We await your prompt compliance with international conventions and basic human rights.